The Montney Formation is widely regarded as one of the largest and most attractive premier plays in the world. The play is divided between British Columbia and Alberta and spans across northeast British Columbia, south of Fort Nelson, through northwest Alberta, past the Grand Prairies (Figure 1). The Montney Formation covers a wide geographical region of approximately 130,000 km2[i], and is relatively thick, between 100m-300m[ii]; the pure rock volume is what allows the formation to hold tremendous amounts of oil, gas, and NGLs. 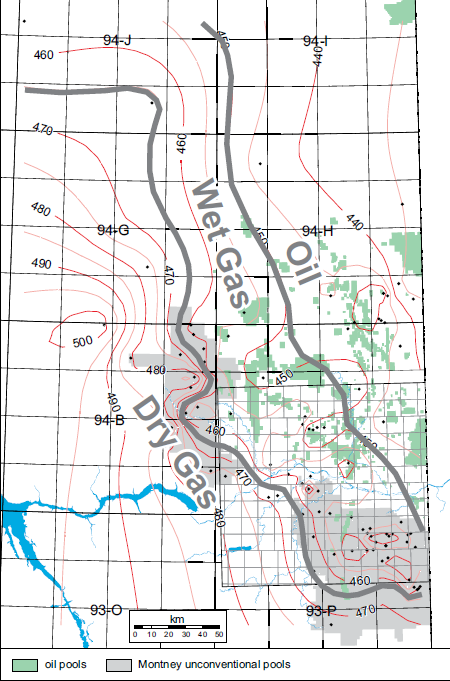 The geographically extensive siltstones of the Montney are estimated to hold approximately 449 Tcf of marketable natural gas, 14,521 MMbbls of marketable NGLs, and 1,125 MMbbls of marketable oil[iii], according to the National Energy Board (2013). The Montney siltstones were relatively undeveloped until 2005. 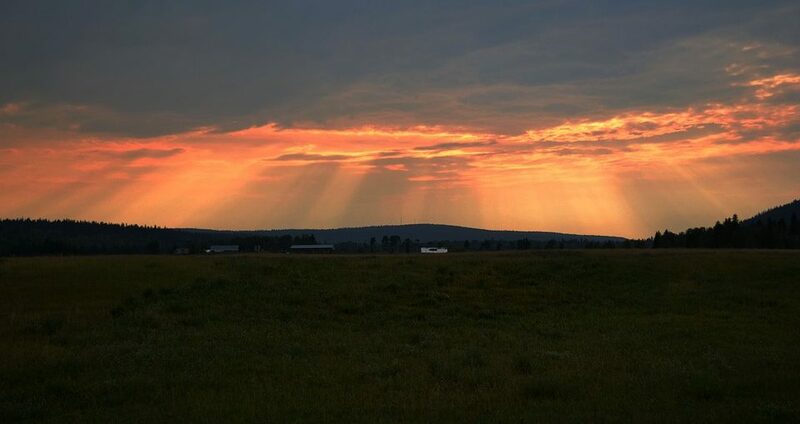 It was not until the introduction of horizontal drilling and multi-stage hydraulic fracturing that allowed for the development of this unconventional resource. 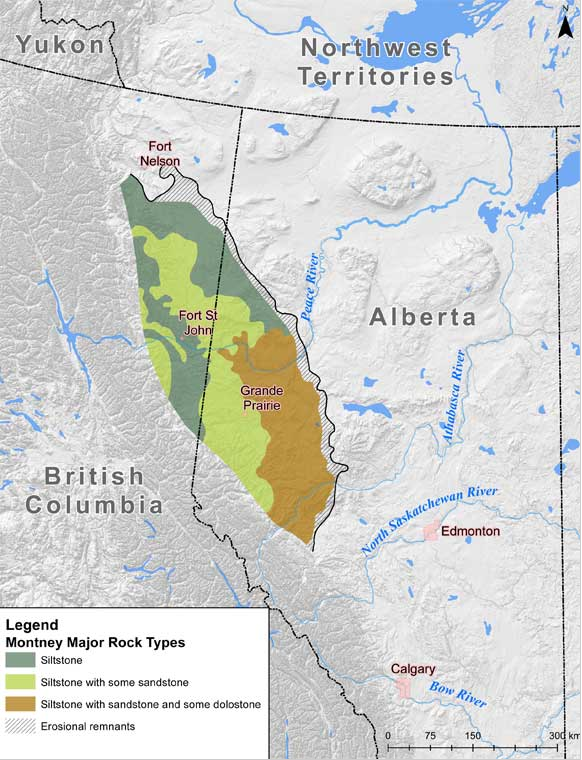 The Montney Formation, by 2020, is expected to grow to 7 Bcf/d, which will represent 38% of the Western Canadian Sedimentary Basin’s (WCSB) total production[iv]. By 2040, the National Energy Board predicts that the Montney will make up more than half of the country’s production. The Montney is often comparable with the Marcellus Formation in northeast United States. 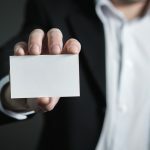 The Montney is very attractive to many producers due to its thickness, low break-even costs, superior economics, multiple stacked reserves, large marketable gas and liquids resources, incredible liquids potential, and great access-to-market. Depending on where the producer is in the Montney, the type of gas/liquids they extract will vary. The Montney produces more dry gas in the western zones and more wet gas in the eastern zones[v] (Figure 2). Historically, extraction has been very profitable for producers as the stacked nature of the Montney allows producers to extract resources at different depths, where one rig can often return different sorts of hydrocarbons. The amount of developed infrastructure to transport the extracted gas, coupled with the low break-even costs are truly some of the core reasons that makes the Montney one of the most popular plays in North America. All windows have seen very profitable extraction by various producers and there is usually overlay of zones that are exploited well via horizontal drilling (stacked pay) so one rig can access all sorts of hydrocarbon yield. The basin is split between British Columbia and Alberta, with the play having more dry gas in the west and more wet gas in the east. The play is large, with total area comparable to the size of the Marcellus shale. The Montney is conventionally segmented into the Northwest, Central and Southeast, with the mix going from mostly gas to more liquids/condensate the further East on the production zone. The center is considered to have the best gas return economics after the Marcellus SW, but superior to the Marcellus NW. The Montney is the top Canadian basin in terms of popularity and Montney assets usually are assigned the loftiest valuations per acre. Although it is referred to as “shale” (which we may use for simplicity from time to time on this website), it is not a true shale by denotation but rather a siltstone reservoir. Breakevens in the Montney are extremely low, and takeaway to end market demand is plentiful compared to other BC plays such as Horn River, explaining its popularity among investors. Depending on where a producer is located on the Montney, there are zones where there is mostly dry gas, wet gas, or pure condensate. The producers in the wet gas and liquids windows will trade at higher multiples – as measured by price per acre or price per flowing barrel in terms of valuation. Encana is currently one of the largest players in the Montney. Encana currently holds 9,600 well inventory and 6,900 premium locations[vi]. In October 2017, Encana’s Montney totaled over 147,000 boe/d, with liquids production over 25,000 bbls/d, up 42% from the third quarter[vii]. Encana expects to grow their liquids production to ~50-60,000 bbls/d by the end of 2018, and to ~70,000 bbls/d by the end of 2019 with ~35% liquids CAGR through 2022[viii]. With the expected ramp-up in Montney production, Encana has also formed a partnership with Veresen Midstream where Veresen Midstream provides the gathering, compression, and processing services for Encana’s development of liquids and Natural Gas production in the Montney. As of September 2017, Veresen Midstream has agreed to provide ~630 MMcf/d of natural gas gathering and compression and 652 MMcf/d of natural gas processing under a long-term service agreements with terms that range between 15-28 years. Seven Generations is a major player that holds a core focus in the Montney. In the third quarter, Seven Generations’ production averaged 183,920 boe/d (59% liquids), up 39% from Q3 2016. They delivered funds from operations of $284.3 million, up 34% from Q3 2016. Seven Generations also delivered operating netbacks prior to hedging of $18.94 for the three months ended September 30, 2017. For the third quarter, capital investments for Seven Generations totaled $454.3 million and the annual investment guidance is estimated to be ~$1.6 billion for the year. Seven Generations has also established long-term infrastructure partners with midstream players such as Kinder Morgan, TransCanada, and Alliance Pipeline to distribute its production across North America and down to the Gulf Coast. ARC Resources is another major Montney player with core production areas such as Dawson, Parkland, Sunrise, and Ante Creek. ARC achieved a production average for Q3 of 129,526 boe/d (29% liquids) with funds from operations of $163.8 million and pre-hedging netbacks of $12.64. Capital investments for Q3 primarily focused on drilling and completion activities in the Lower Montney and the expenditures totaled $178.4 million, before and net property acquisitions and dispositions. ARC has announced a 2018 capital budget of $690 million that revolves around long-term profitability through the development of ARC’s Montney assets. EnCana produces over 1bcf per day in the Montney and Progress is close to 800mmcf/day. Shell and ARC are slightly above 400mmcf/day with all other producers producing less. Remember that to get to the barrel of oil equivalent you divide thousand cubic feet by 6. The Montney has very good access to market (partly explains popularity among megafund private equity involvement in companies such as Seven Generations Energy), with connections to TransCanada’s NGTL system where there are myriad receipt and delivery points. The system is pragmatic with inexpensive expansion costs and well defined tolls (we may write more about this in the future, in the meantime please refer to National Energy Board filings under TransCanada PipeLines). Alliance Pipeline’s Canadian segment also services the Montney, and has much of their shipping contracted with Seven Generations. From the NGTL, Montney gas has access to the oil sands, and Western and Eastern US markets. Should Jordan Cove LNG be approved, the Montney will be a key feedstock for gas to Asia. Additionally, as the cost of transport falls (costs on energy infrastructure depend on an allowed return on rate base or deemed undepreciated asset base) due to a falling rate base, gas extraction becomes economic at a lower price netback. Jun 14, 2017: TransCanada invests $2 billion to expand NGTL system capacity, which is set to add ~3 Bcf/d of incremental capacity[xviii], of which numerous shippers have already contracted ~2.6 Bcf/d of the new capacity. The expansion was made to better service growing Montney demand and connect low-cost Montney, Duvernay, and Deep Basin production to premium export markets. This additional $2 billion adds to the already-invested $5.1 billion that TransCanada has allocated to NGTL. The NGTL provides access for Montney gas to reach not only the oil sands, but also the western and eastern US markets. This diverse structure of receipt and delivery points, integrated with relatively inexpensive expansion costs and well-defined tolls make it a popular transportation option for many producers. May 11, 2017: Enbridge announces a $1 billion investment for the T-South natural gas pipeline expansion project[xix]. The pipeline expansion is set to add 190 MMcf/d of additional capacity supported by long-term contracts to service the growing demand for Montney production. If the Jordan Cove LNG project is approved, it would allow Montney producers to have better access to distribute their gas production, making Asia an ideal gas feedstock. This should further increase the popularity of the Montney amongst producers.